Ramsey on what the new University of Texas/Texas Tribune poll says about the governor's race, education, immigration, and other issues; Grissom on a far West Texas county divided over Arizona's immigration law; Ramshaw talks health care reform and obesity in Texas with a legendary Dallas doctor; M. Smith on the Collin County community that's about to break ground on a $60 million high school football stadium; Aguilar on the backlog of cases in the federal immigration detention system; Philpott of the Green Party's plans to get back on the ballot; Hu on the latest in the Division of Workers' Comp contretemps; Mulvaney on the punishing process of getting compensated for time spent in jail when you didn't commit a crime; Hamilton on the fight over higher ed formula funding; and my sit-down with state Sen. Kirk Watson, D-Austin: The best of our best from May 24-28, 2010. 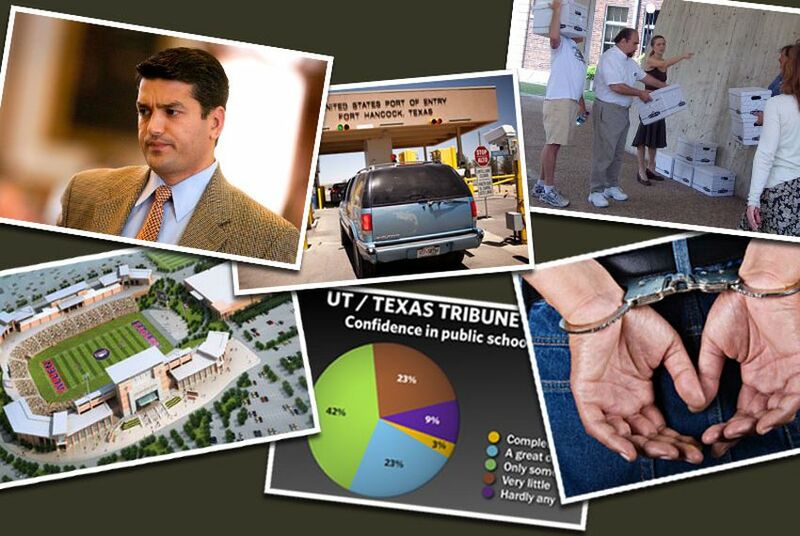 According to a new University of Texas/Texas Tribune poll, Gov. Rick Perry leads his Democratic challenger, former Houston Mayor Bill White, 44 percent to 35 percent; more than two-thirds of Texans say their confidence in the state's public schools ranges from shaky to nonexistent; Texans narrowly oppose a "pathway to citizenship" for illegal immigrants; and a majority of Texans believe the state is on the right track, while a plurality thinks the country is on the wrong track. Kenneth Cooper, the world-renowned Dallas doctor who essentially invented jogging as exercise, talked with the Tribune about health care reform, the crisis of obesity in Texas, and what lawmakers must do to shore up the physical-education legislation they passed last session. Allen High School is a study in bigness: A 5,000-student campus with a 650-member marching band supporting a football team that draws 8,000 fans to away games. And now — the pinnacle of suburban spoils — the Collin County community will break ground on an 18,000-seat stadium, the largest occupied by a single team. Pricetag: $60 million. The number of unresolved cases in the federal immigration detention system has reached an all-time high, driven in part by surging backlogs in Texas, especially in San Antonio and El Paso. Blame it on not enough judges. Texas has among the most restrictive ballot access laws of any state, which is why the Green Party hasn't put its candidates before voters here since 2002. But party activists hope to end the dry spell this year. The state Division of Workers' Compensation has uncovered "tens of millions of dollars in unnecessary medical care" in the last several years, but its commissioner failed to sanction the doctors involved, a key former employee told members of the Sunset Advisory Commission on Tuesday night. Let's say you served time for a crime you didn't commit: How much is each year you lost really worth? A new law increases the state's payout to exonerees, but the process of getting compensated is its own form of punishment. Should we base the funding of state universities on course completion rather than enrollment? The Commissioner of Higher Education says yes. Some state lawmakers say no — not until we attack the manipulation of the financing formula by the higher ed lobby. For the 10th event in our TribLive series, Evan Smith interviewed state Sen. Kirk Watson, D-Austin, about the budget shortfall, the road funding hole, why Barack Obama is unpopular in Texas and the prospect of Bill White beating Rick Perry.